We love Thanksgiving here at ProPRcopy. Each year, the long weekend gives us an opportunity to take a little break, spend time with family and friends and reflect on all we’re fortunate enough to do on a daily basis. Personally, it’s hard for me to believe just how quickly time has passed since we launched our copywriting agency in April 2010. Back then, we were all feeling the aftereffects of the Great Recession. It certainly wasn’t the easiest time to start a business, and we had no idea if it would work. Thankfully, we caught some early breaks. We started to gain traction with the small number of clients we secured during our first few months of existence. Happy with our services, they began to refer others to us. Our handful of writers grew to a dozen. Then to 20. And eventually to more than 100. As we grew, we remained steadfast in our approach of delivering more responsive and personal service than our competitors. Our industry was full of what we call “content mills” — companies that simply aggregate thousands of freelancers and match them with clients. We knew we could do better. Recognizing that the status quo left much to be desired, we combined a technology-driven, highly efficient process with an old-school approach to customer service. Our clients could pick up the phone and speak with a senior editor whenever needed. They could get to know their content writers and build a relationship of trust, making for strong long-term partnerships. This model has served us well. However, we owe most of our success to people, including our clients and writers and editors who work for us. To our clients, we thank you for placing your trust in ProPRcopy and the copywriting services we provide you. It is a privilege to work with such a diverse group of businesses and organizations, ranging from small startup companies and boutique marketing agencies to large corporations and magazine publishers. 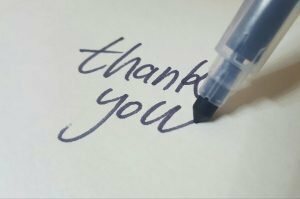 We are grateful every day that you turn to us when you need written content, whether it’s a single blog post or hundreds of web pages. I’d also be remiss if I did not thank our incredibly talented team. Each day, our writers create content on just about every subject one might imagine, from automotive and HVAC maintenance tips to complex financial planning and legal issues. They are truly dedicated to their craft and continue to uphold the high standards of quality and responsiveness on which we’ve built our business. From the entire ProPRcopy family, we sincerely hope you have a wonderful Thanksgiving.